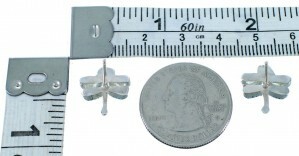 Post earrings measure approximately 5/8" long and 1/2" wide. Excellent craftsmanship is shown throughout this amazing pair of earrings! 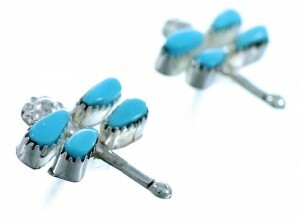 This piece of Native American jewelry is Zuni hand crafted, out of genuine sterling silver and real Turquoise stones. 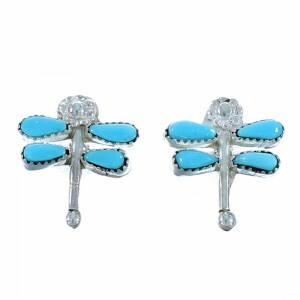 A total of EIGHT stones (FOUR in each earring) are carefully placed in hand cut bezel settings, while hand crafted silver work creates lovely dragonfly and flower designs for a remarkable finish. Dragonflies are connected with water springtime, fertility, renewal, and are considered a messenger.